I roam around a lot these days. First, I crawl super fast. As you’ve seen I go up and down the stairs like a pro. 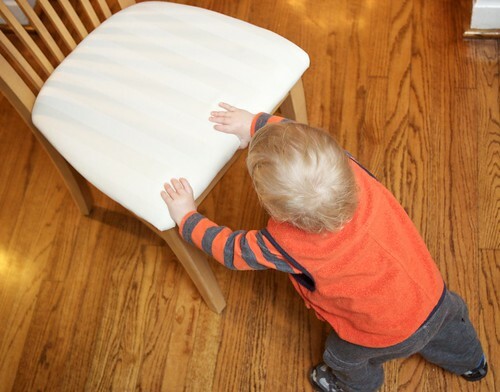 One of my current favorites is to grab onto a chair and walk around a bit. Here, see for yourself. Though, to be honest, I’m not that picky. If I can’t find a chair to push, I’ll settle for whatever I can find. I also got a new toy from my friends Claire & Elliott. It’s a bike. Finally, I just love going for a magic carpet ride. We can’t take complete credit for this, as Daddy got the idea from a friend, but it’s still my new favorite thing. At first I wasn’t really sure what was going on. Now, whenever I see the magic carpet I run over and lay down on my tummy while Dad or Mom pulls me around.